It is a fact universally acknowledged that I dislike the colour pink. I used to loathe it but over the years I’ve mellowed a bit and can appreciate that, in certain situations, it works. 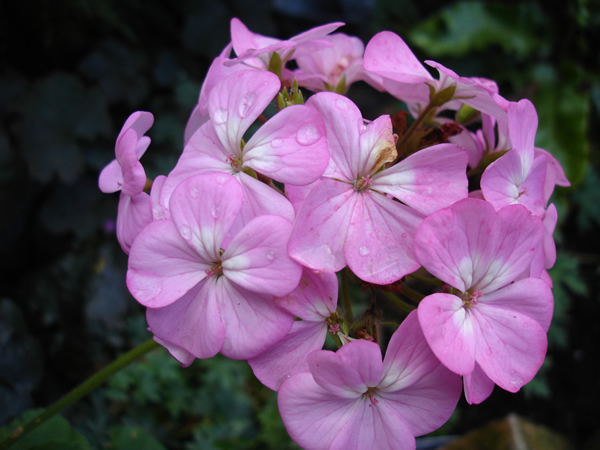 At this time of year there’s an inordinate amount of pink in the garden. 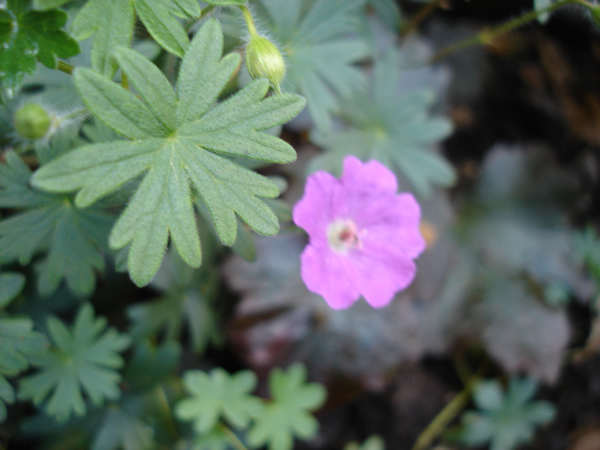 Cranesbill and pelargoniums still flowering for all they’re worth, and winter cyclamen blooming away merrily. 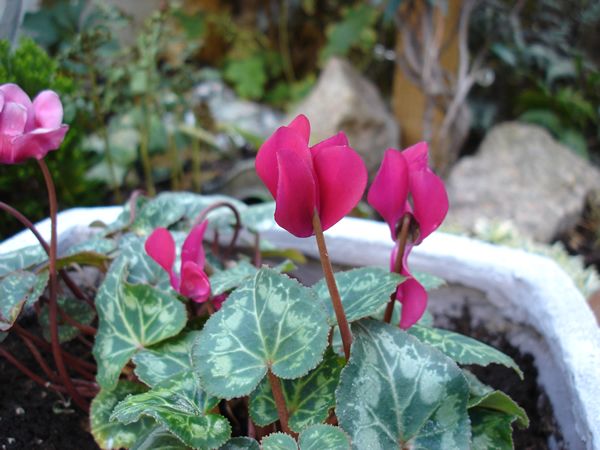 Looking at the cyclamen reminded me that I picked up some gorgeous paper while I was up on the Orkneys this summer. I’d stashed it away safely, and today it felt like the right time to use it. The problem, if you can call it that, is that both sides of the paper are very pretty. 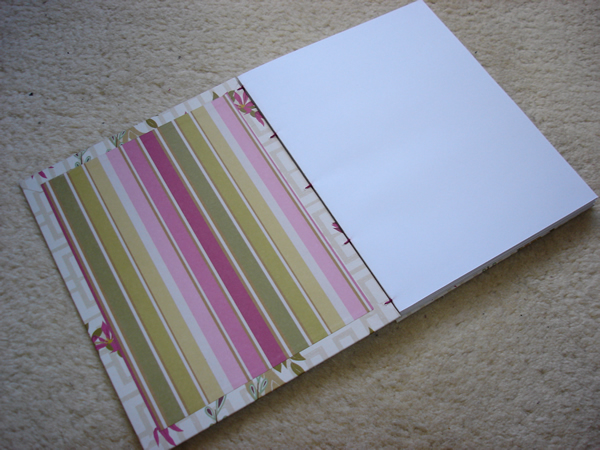 For the first book I used a dark pink murano paper for the lining, but for the second I decided to use the reverse of the paper to line the covers. 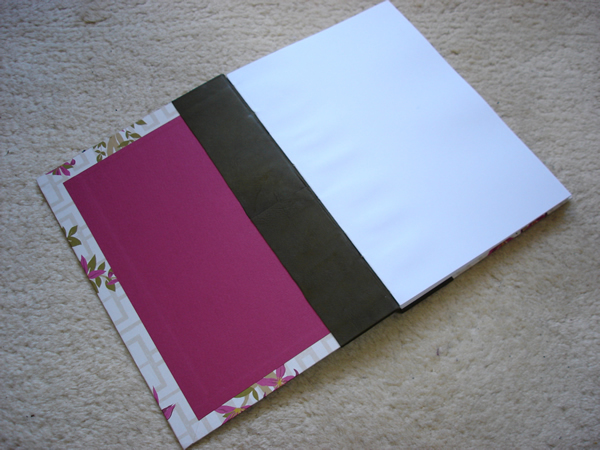 I think both work well, and I particularly like the dark green leather (which is actually a shade lighter in real life than it appears in the photographs) against the pinks of the paper. 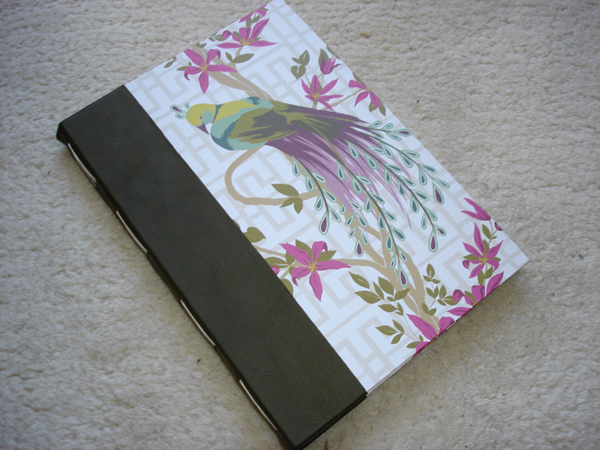 Two pretty notebooks, both to be added to Etsy later this week. I’ve done a lot of wedding commissions, but this has to have been my favourite so far. Not only was it a lot of fun, the venue that the reception is being held at is a place for which I have a huge soft spot: Howling Hill House. 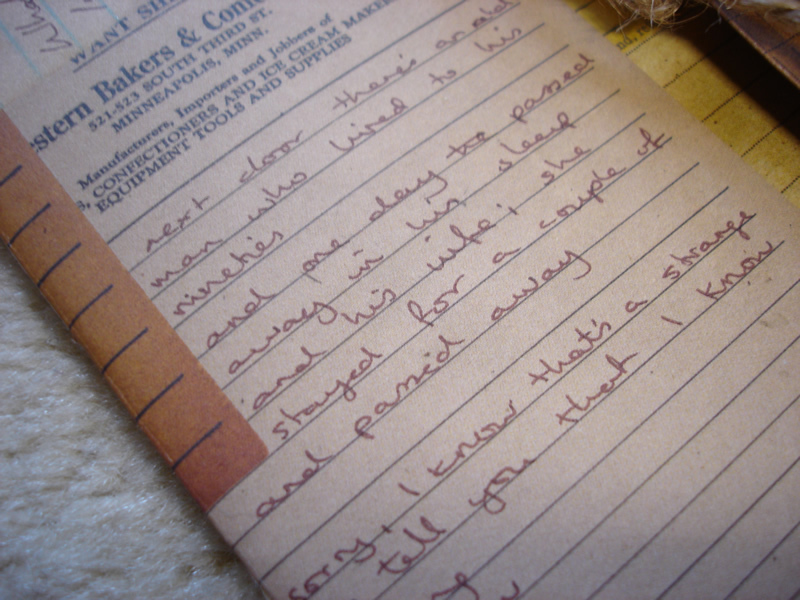 The couple’s very vague brief was this: they wanted the invites to be small notebooks with just a few pages (and a map), if possible the cover should feature the lyrics from a song they love, and it should be vintagey or countryside in theme. There were only five invites to be made, and each one would be personalised to include the name of the room at Hill House which the guest had been allocated. 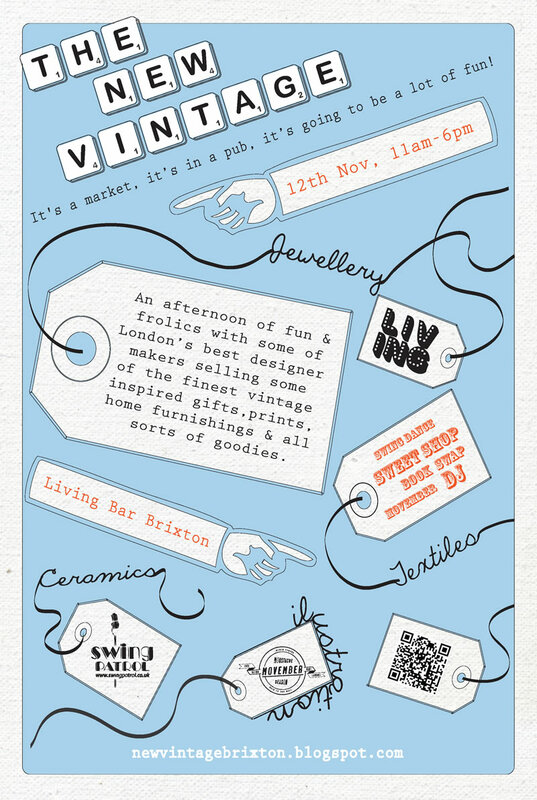 After much pondering I came up with the idea to make it sort of scrapbooky/vintagey in style, and here’s the final result. 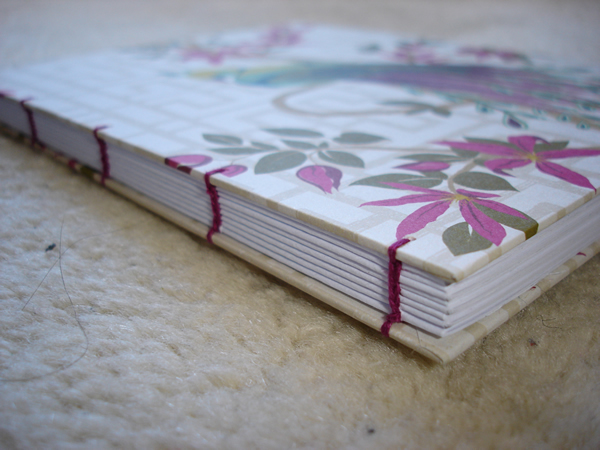 Because each book only contains six pages I opted for a wrap-around style as experiments showed that binding so few pages in any other style looked a bit odd. 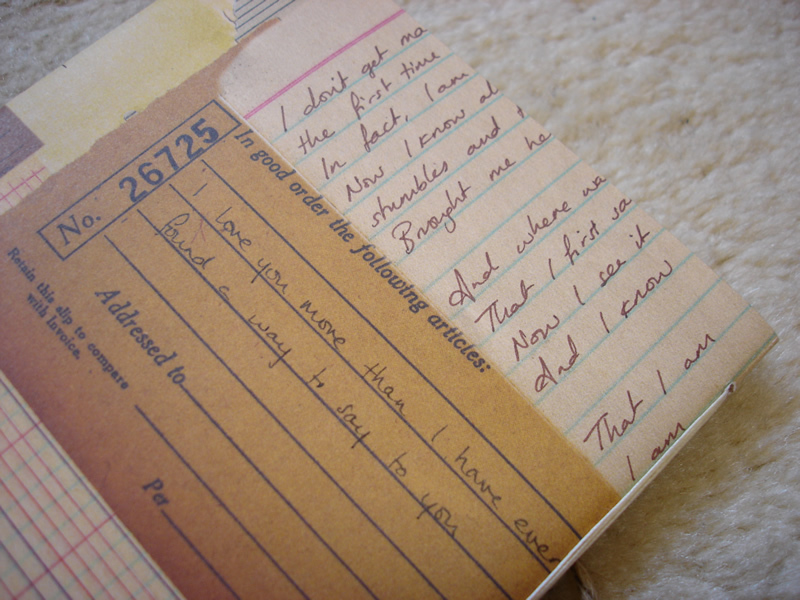 I chose a gorgeous paper by 7Gypsies for the covers, and added the lyrics from their chosen song by hand. 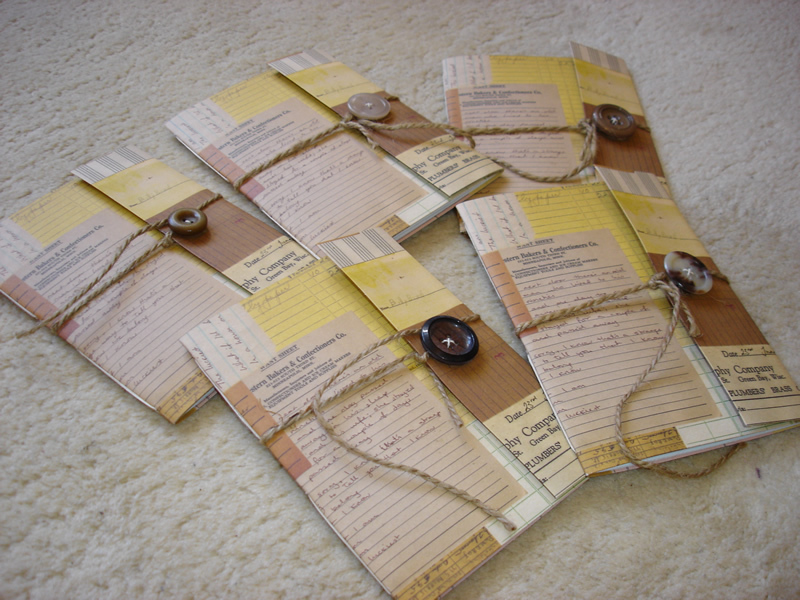 The inside of the covers were lined with brown parcel paper, to add to the scrapbook feel. 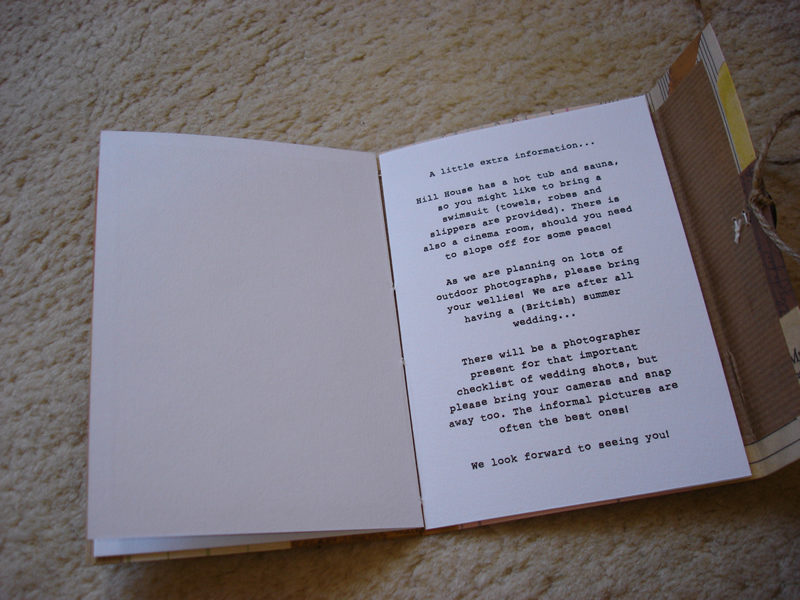 The pages are a lovely 200gsm cartridge paper, and the couple chose a typewriter style font for the text. The invites contain two maps. 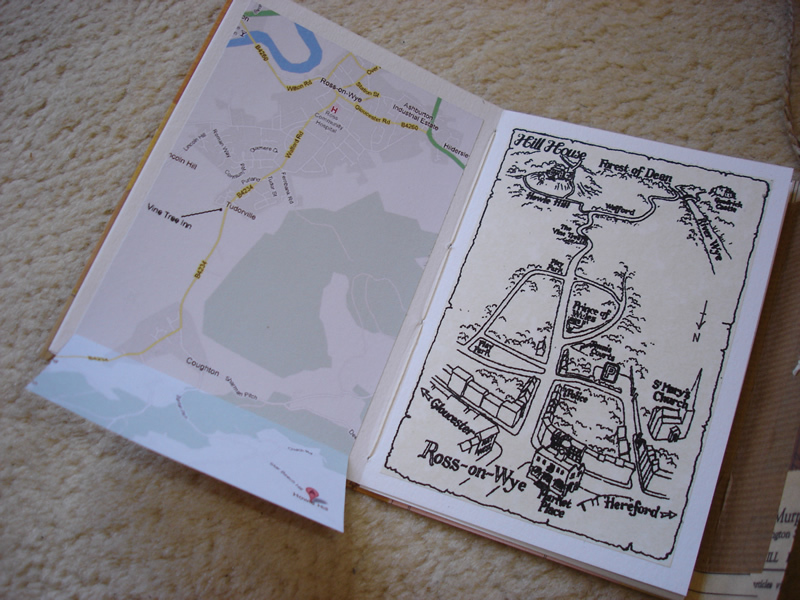 One is the very pretty map from the Hill House website (pretty, but not actually that accurate), and the other is a little map printed from Google (not so pretty, but a far better aid to navigation). 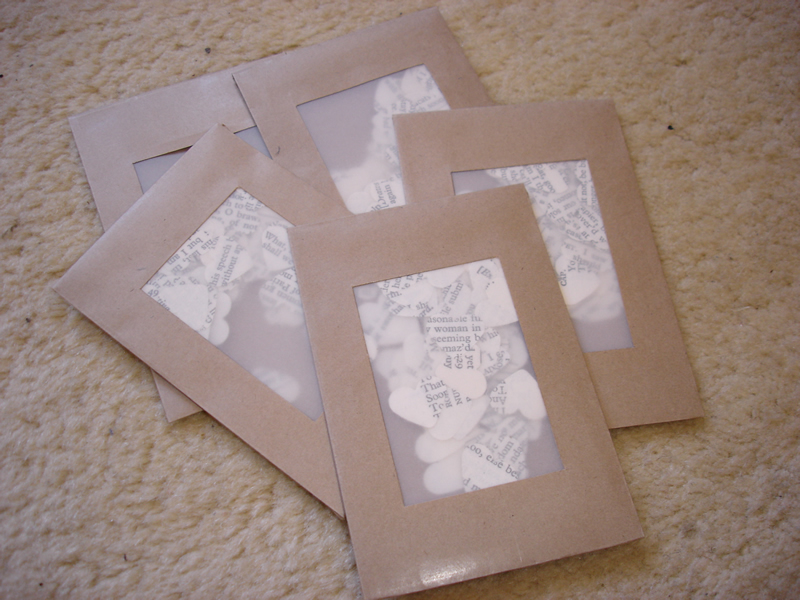 As an extra touch I made some little envelopes and filled them with heart-shaped confetti that I punched from vintage pages of Romeo & Juliet. These have been tucked into the back of each invite. 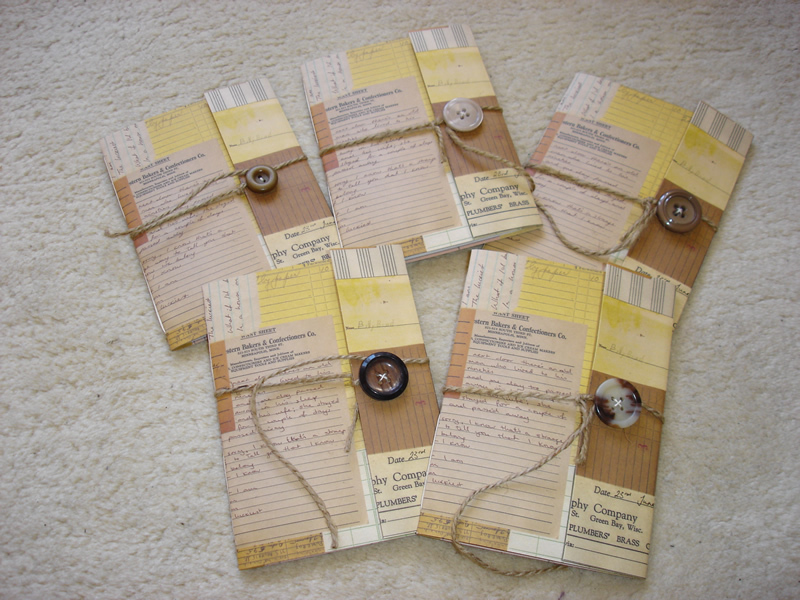 Finally, the invites were fastened with some lovely coarse twine and a button (a different style button for each invitation). So there we have it, five very unique invitations. 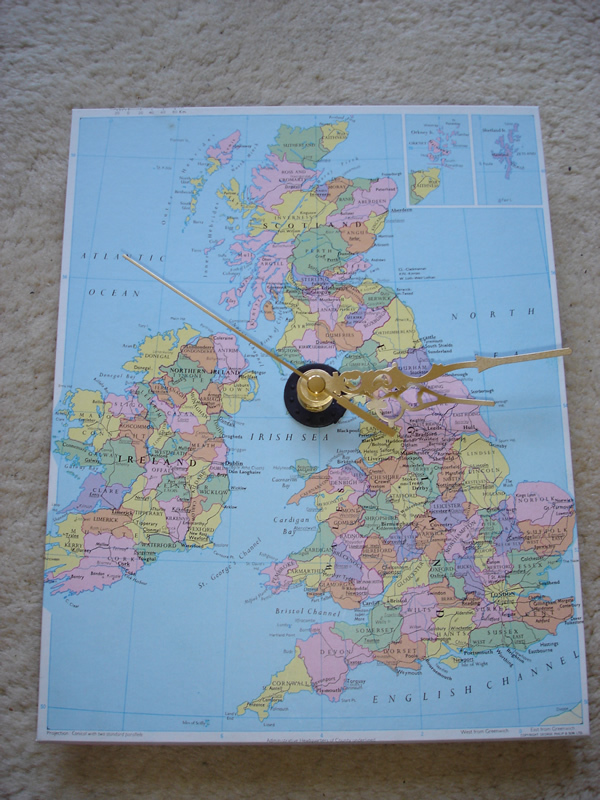 I’ve had a hankering to make clocks for a while. I have a very specific type of clock in mind, and I’m not yet ready to attempt it, but in the meantime I thought I’d have a bash at a simple one. 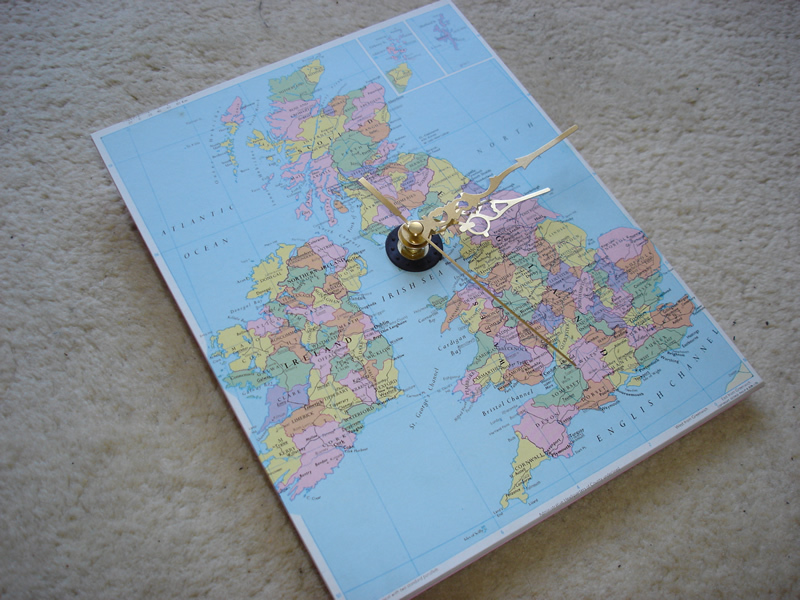 It really is a simple construction, made with two boards, some paper, and a clock movement. 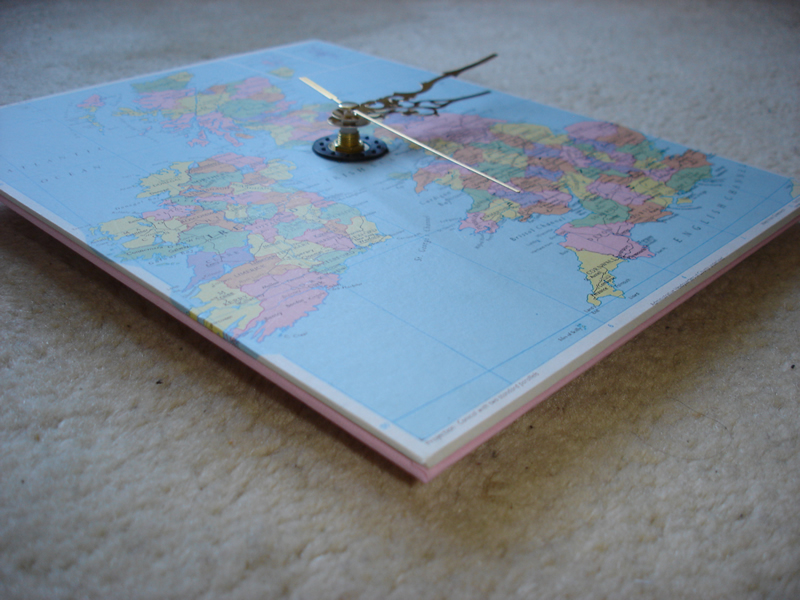 The front board is covered with a page from an old atlas, and the back board is covered with pink wove paper. You might wonder why I covered the two boards separately… well, I needed to use two to get the thickness I wanted, but it turned out that the page from the atlas wasn’t quite big enough to wrap completely around the double thickness of board. 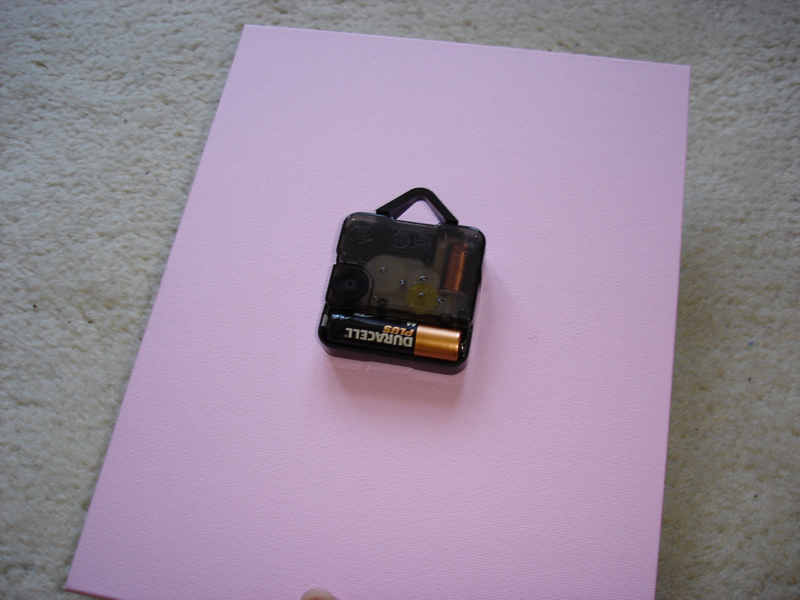 So I ended up sandwiching the two boards together after they’d been covered, but I do think it works well. Simple, but very effective. I hope this finds a good home at The New Vintage fair next month – I’d love to put it on Etsy, but I’m afraid that the arms will get bent or something if I packaged it up for posting! 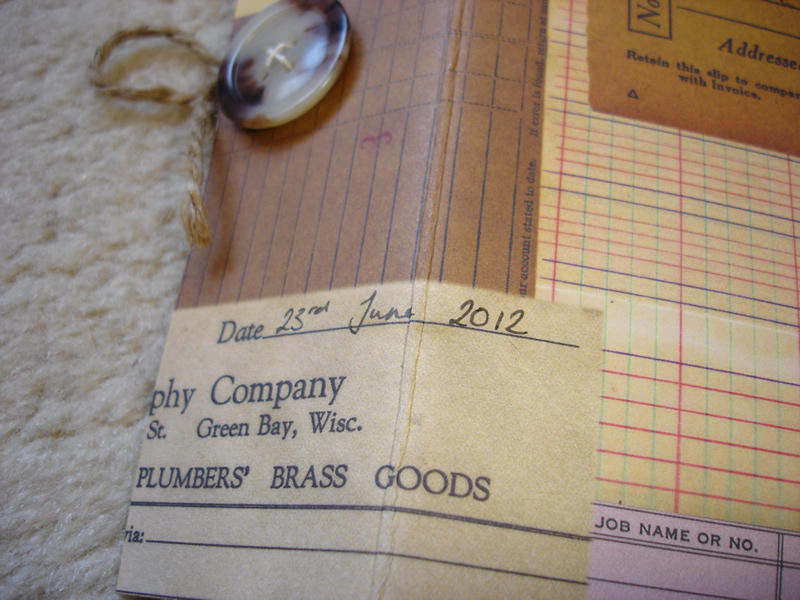 I do like revamping vintage books and turning them into new notebooks. Usually I choose books that have beautiful covers, but occasionally I choose a book for the title rather than what it looks like. The School for Scandal is a perfect example of this. 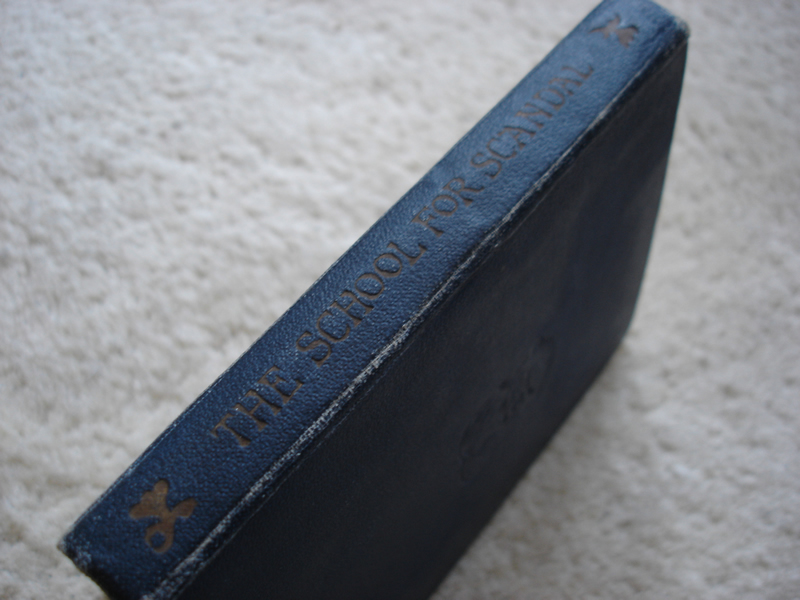 The cover is, let’s face it, very dull: dull plain blue, nothing special. But the title? Ahh the title is superb. 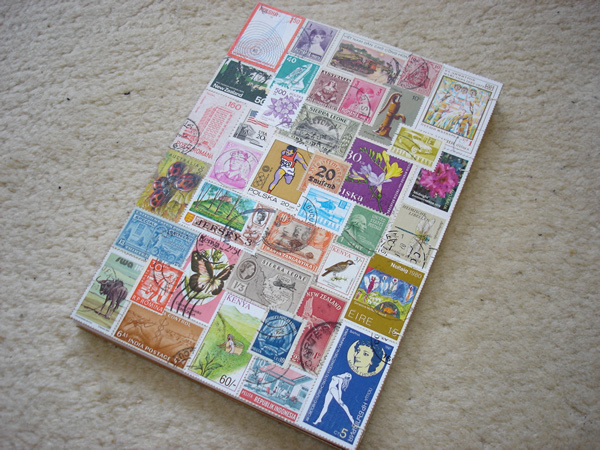 When I first saw it I just knew that one day it would make a perfect journal for someone. 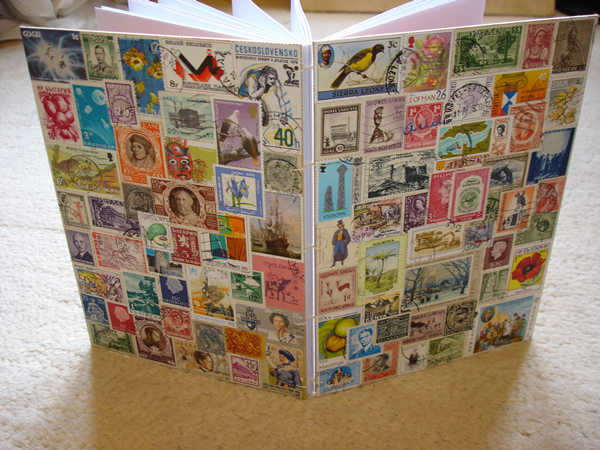 The original end papers were boring: just plain cream (actually I suppose they were once white, but had yellowed with age). 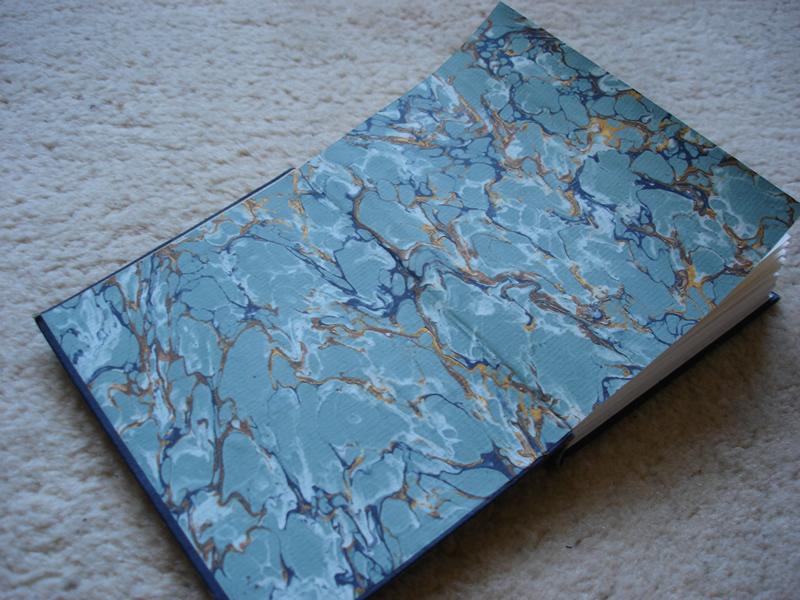 I thought a special book like this deserved something prettier, so the new end papers are a gorgeous hand-marbled paper in blue and gold. 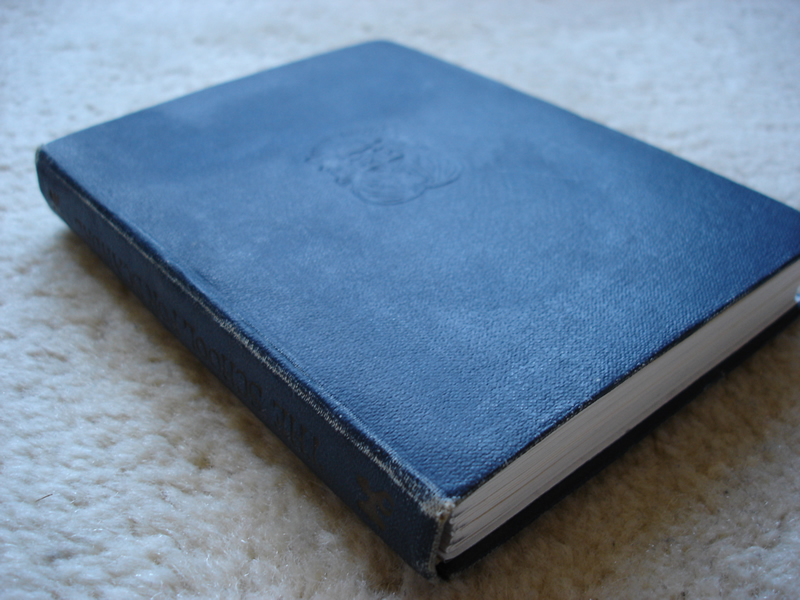 So we’ve ended up with a book that looks very unassuming on the outside, but very special inside. 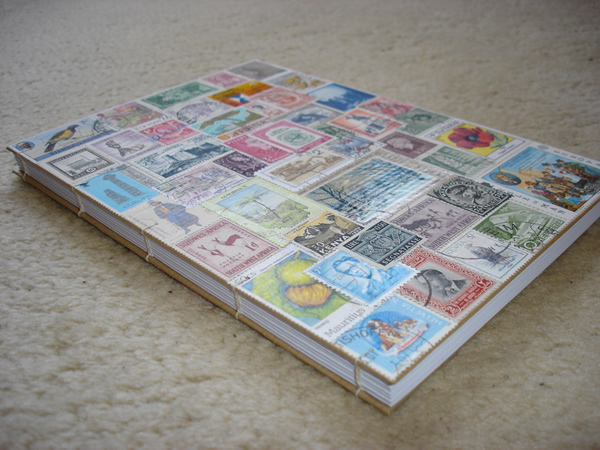 The pages are smooth cartridge paper so this would be suitable for use as a sketchbook as well as a journal. Click here to view the listing on Etsy. 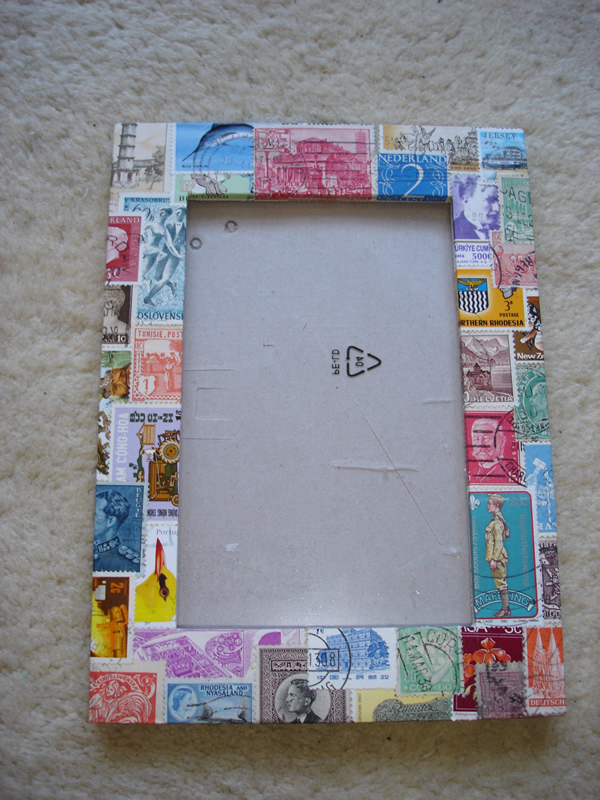 I’ve been having a lot of fun with découpage lately. 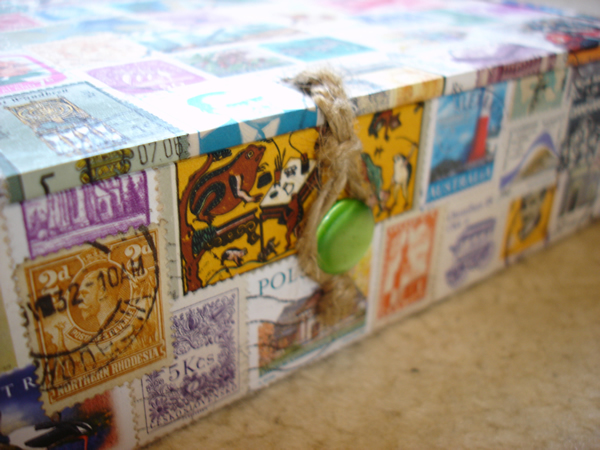 Strictly speaking, découpage involves varnish of some description – and I prefer a more simplified approach because, with only a few exceptions, I dislike varnished finishes. Something about the texture I think, I just prefer a matte finish. So I don’t put anything over the top (i.e. no PVA, varnish or Mod Podge), which makes for a less durable finish (because it’s not water resistant), but I much prefer it. 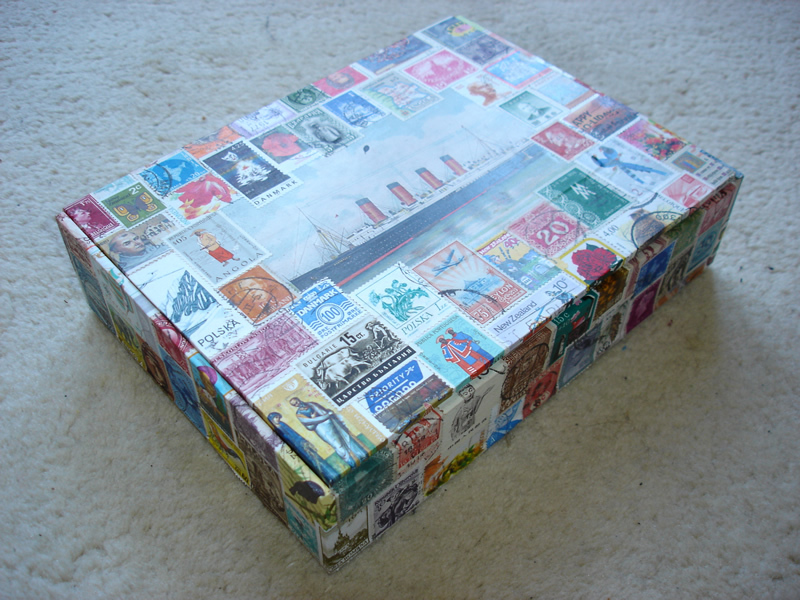 The picture in the centre is a vintage postcard from 1910 (I checked the postmark on the back); the rest of the box is covered with a selection of used stamps from all over the world. 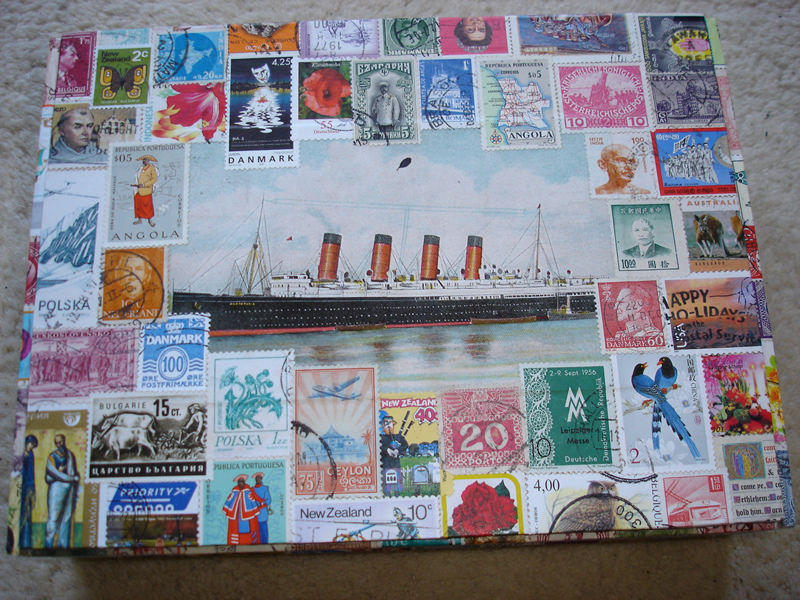 Click here to view it on Etsy. 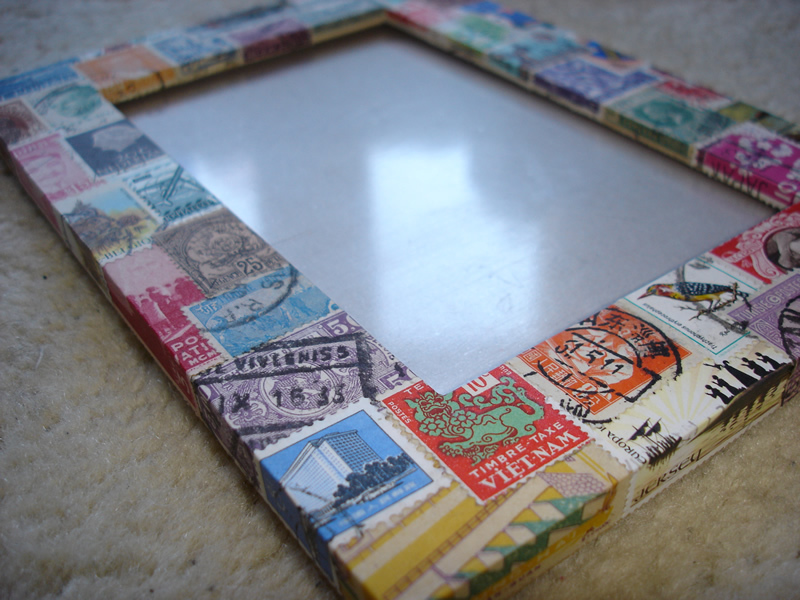 Next up we have a couple of photo frames. 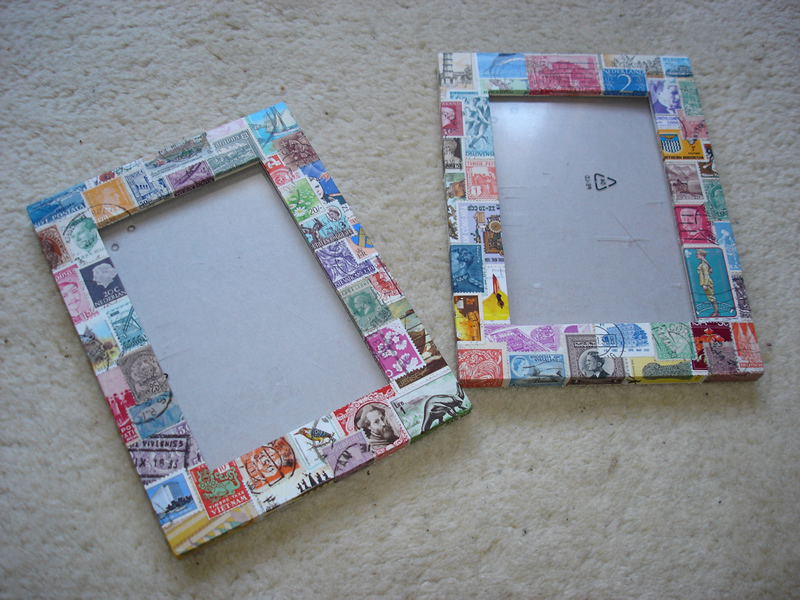 They’re just cheap and cheerful IKEA frames, but covering them with stamps has given them a whole new purpose in life: looking utterly gorgeous. 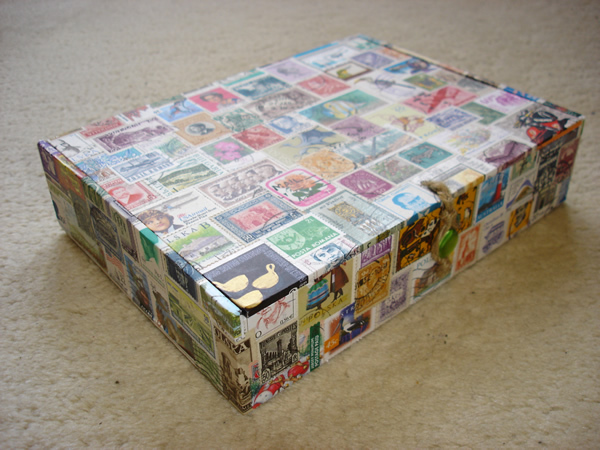 I do seem to be in the midst of a stamp/découpage frenzy at the moment, I’m not sure how long it will last but I’m enjoying it a lot and I hope you’re enjoying the results.